The Village Archive: 10 years ago. . .
He’s got a point; why should the life of an “ordinary” person be any less worthy of committing to paper than that of a “celebrity”? That said, Cas has probably led a slightly more interesting life than some, given that his work has taken him quite literally around the world from South Sudan to the Philippines to Venezuela and even Iraq, places that most people would never get the chance to visit. These journeys, and the resulting anecdotes, are only part of the story, which meanders through various periods in the author’s life – the book is divided into themed sections rather than using a strictly chronological narrative, which Cas puts down to the fact that he didn’t necessarily remember things in order. 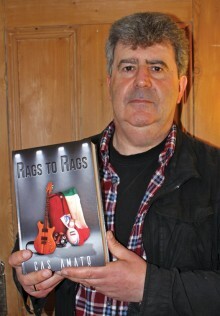 Cas also includes musings on his Italian heritage, while his memories of childhood, school days and teenage years in the 1960s and 70s will resonate with people of a similar age. Tales of working at Longbridge and life in the Barnt Green area will also appeal to local readers. After he sent the manuscript out to various publishers, with no real expectations, one agreed to publish the story, and it’s now available via Amazon (including a Kindle edition) and Waterstones. HAVE YOUR SAY . . .
What do you think? Share your views by typing in the box below.